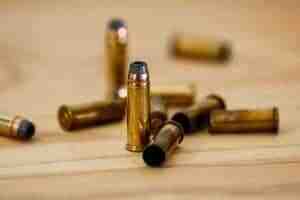 Many avid shooters prefer to reload their own bullets. Reloading your own bullet is cheaper than buying them. It also allows you to tinker with the bullet, mix and match various components until you have the perfect one for your gun. The first and the most important equipment you need for this is the reloading press. 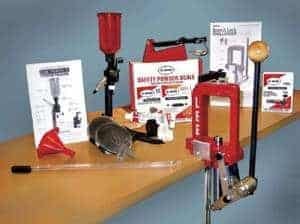 Some of the bestselling reloading presses are Hornady Lock N Load Auto-Progressive Reloading Press , Lee Precision 50th Anniversary Reloading Kit, Lyman Reloading Press and RCBS Rock Chucker Supreme Master Reloading Kit. All prices and ratings mentioned in this table are accurate at the time of publishing and may change with time. 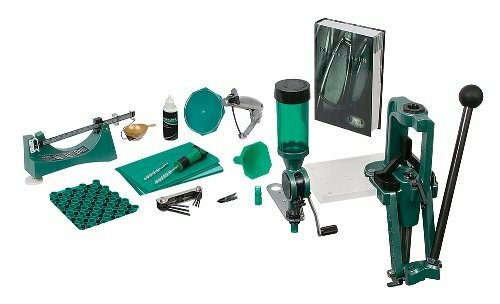 Long considered to be the best single stage reloading press, the RCBS Rock Chucker Supreme Press is part of this reloading kit which includes a scale, uniflow powder measurer, hand priming tool, case loading block, deburring tool and a hex key set. RCBS Rock Chucker Press is considered to be the benchmark against which all single stage reloading presses are measured. The supreme version is a little longer to accommodate the longer cartridges of today. It has an O shaped frame which is strong and stable. It is also much heavier than many other presses which gives it additional stability and ram pressure and precision. It has an ambidextrous handle. The quality of engineering can be seen in the fact that the pins are supported on both sides of the link. It is easy to install and use. The kit that comes with it is little over 80% complete. Made of high-quality materials, this reloading press simply lasts for years. It is also easy to maintain. It comes with a lifetime warranty for its reloading press which none of the other companies in the market offer. For the price, some more items could have been added to the kit especially a mounting plate and bolts. This is an expensive item for a single stage reloading press. It is available for a great deal at amazon.com. You can also check out your local gun store. 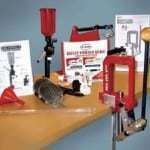 The Hornady Lock N Load Auto-Progressive Reloading Press has long been considered by most reviewers to be the best progressive press in the market. The Hornady Lock N Load reloading press is a progressive type of press which means the entire process of reloading a bullet from removing the spent primer to sealing the casing is done in one movement of the press. This means that you can reload your bullets faster and more efficiently. However, there are some purists who claim that progressive reloading presses are not as accurate as single stage and turret presses. The system can load 500 bullets in an hour. It has an EZject system is an ejection system which lets out perfect bullets each time. The quick changing bushing system allows you to change the dies quickly and without any fuss. The universal case retainer spring which holds the spent brass in place can be used with cases of any caliber. The automated system includes a Case Activated Powder Drop mechanism which ensures powder is only dropped when a case is present below the dropper. The progressive reloading press is a complicated machine which requires constant maintenance for a longer life. But a well-maintained machine lasts for a long time since it is made with good quality materials in the USA. Fast Swapping mechanism for dies. 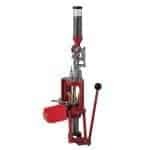 This reloading press is available in your local gun store or for a great price on online sites. It is an expensive reloading press. 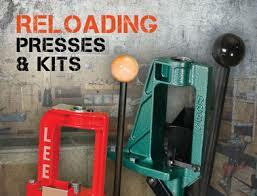 This Lee Precision 50th Anniversary Reloading Kit is a tribute to the 50 years of Lee’s reloading history. 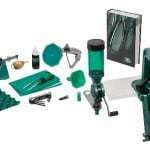 It is the best kit for a beginner who wants to see if reloading is what he/she wants to do. A kit which includes a scale, breech lock bushings, calipers, etc. The Lee Precision kit includes a Challenger press which has an “O” shaped frame. This frame makes it easy for you to move and work around. The “o” shape ensures that the opening is large enough for you to comfortably shift dies and brass. The toggle links are made of steel. The entire press has a smooth operation and is easy to use even for a beginner. The press should be bolted down to a wood or a metal surface for greater stability. However, the kit does not include the bolts required for this. The kit includes a decent digital scale. It may not be the top of the line scale, but does a good job of measuring the grains. It has been calibrated by the US Bureau of Standards. The quick change breech bushing system ensures that it is easy to change dies. The O frame of the press is stable and durable. The links are made of steel and hence are stronger and have more life. The scale is made of phenolic metal which is tough and nearly unbreakable. You still need to buy dies etc. It is one of the cheapest reloading press kits on the market today. 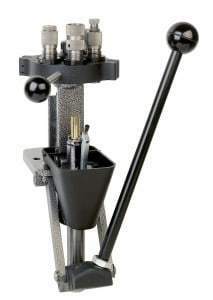 You can also get this reloading press in your local gun and gun accessories shops. This Lyman Reloading Press T-Mag Turret Press long considered to be one of the best gun accessory manufacturers in the industry. The Lyman Manual for reloading is considered to be the Bible for gun aficionados. Turret handle is also the wrench. The Lyman T-Mag Reloading Press is a Turret press which means it is a semi-automatic type of reloading press. It has six station turret head which means you can do the entire reloading process from removing the primer to sealing the casing in one go by placing all the different dies required in the six turrets. The turrets turn easily. This ensures that you work quickly and efficiently. The turret heads are easy to detach while still maintaining the precision. It has a flat machined based which is easy to attach to a wood or metal surface and is extremely stable. The new turret retention system also helps in making this more stable while allowing for a smoother indexing. The turret handle can be fixed on the right or the left side for ease of use. The handle also acts as a tool for removing and fixing the turret head which means you do not need another tool. One of the best parts, it accepts any standard size (7/8″ x 14) dies, which means if you have older dies you need not discard them or you can buy dies of your favorite brand and use them with this press. See our best AR-10 scope reviews. The frame of this reloading press is made of iron which has been powder coated with a state of the art silver hammertone finish. This along with non-rust handles and links ensures corrosion and rust-free long life. The Iron frame is stable and very durable. 6 turrets mean less time wasted, and more can be done in one go. Works with all standard size (7/8″ x 14) brands. Available at most gun and gun accessories stores, you will get it at a great price at amazon.com. It is the best value for money reloading press and the best reloading turret press you can get. The Lyman Reloading Press is a Turret press which is the best combination of efficient reloading process and accuracy required for a good bullet. It is also easy to use for a beginner. 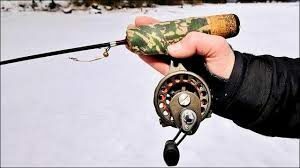 It is also priced to fit into the budget of both a beginner and a pro. The selection of a reloading press is a serious business as once you buy a particular machine, you need to buy dies, shell holders, etc. which go with the machine. This means increasing amount of investment into a particular brand and machine, so think carefully before buying. The most important factor to consider is your skill set – are you a beginner or an experienced reloader? What types of bullets are you reloading? Most importantly what is your budget as the price can vary from around $100-$1000 and then you will need to spend money on the surrounding paraphernalia. Reloading a bullet is a multi-step process – cleaning and lubricating the bullet, removing the spent primer, resizing the casing, putting in a new primer, reloading the powder, seating a new bullet and sealing the casing. A reloading press helps you do the last six of the operations. 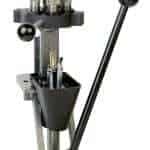 Check out these shooting stick reviews. There are three types of reloading presses. This is the most basic and cheapest of all the different types of presses. Each stage of the reloading needs to be done separately. A single stage press is the best learning tool for a beginner. This also allows for the greatest accuracy. However, this is a very slow process. This is a semi-automatic press in which the dies required for various steps are loaded into different turrets, and you just need to rotate the turrets to go through various steps. This is much faster but allows for a similar level of accuracy and learning as a single stage. However, it is slightly more expensive than the single stage. Almost an automatic process where one pull of the handle does all the steps of reloading in one go. It is very fast. However, it is less accurate and complex. It is also very expensive. You can buy the press separately and the other components individually depending on your tastes. However, if you are a beginner, you might want to buy a kit. Finally read up online and ask experts to help you decide which is the best reloading press that fits your budget and needs. thehighroad.org : New or Old… Which Reloading Press is the Best?